Chakras are the seven spiritual centres in the human body. They are the crown or sahasrara, brow or ajna, throat or vishuddha, heart or anahata, solar plexus or manipura, sacral or svadisthana, and root or muladhara chakras. Chakra meditation is a combination of breathing with chanting ‘AUM’ and different hand gestures to open each chakra. This balances out the chakras, bringing positivite vibes and energy. Mindfulness. Any kind of meditation brings mindfulness, a life skill to make the most out of work or play, life by and large. Creates awareness of the mind and body. While meditating, the flow of white light through the chakra of the corresponding par, one becomes more aware of energy channels or nadi, in the body. Meditation believes in the concept that the body heals by itself but it needs a conducive state. With chakra meditation one is able to drive out distractions and negative thoughts which give the body the power to heal by itself. Damaging thoughts are filled with negative energy which do not allow the chakras to spin. Letting go of the damaging thoughts helps gain better health. Chakra meditation clears mental blockages and helps the mind think clearly. 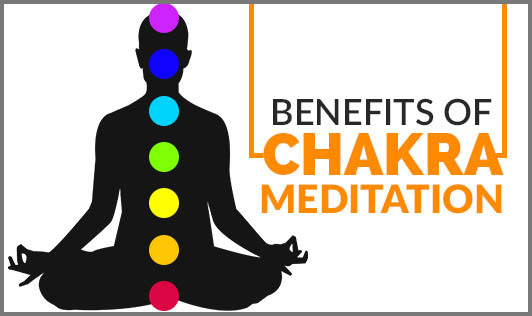 Chakra meditation gives a better body image, realizes the power of mind and helps control temper better. When one gains control over temper he attains inner peace and evokes empathy. It improvises instincts and conscience. Meditation focuses on sharpening the senses and helps us look inward.